The Miyako Islands (宮古列島, Miyako Rettō) are a group of islands in Okinawa Prefecture, Japan, east of the Yaeyama Islands. They are between the Ryukyu Islands and Taiwan. 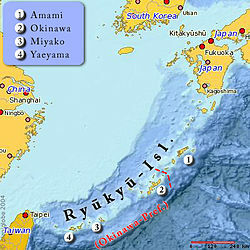 Miyako Island has 55,914 people. A bridge connects Miyako Island to Ikema Island. Ikema Island has 801 people. Tarama village has 1,214 people. It is between the islands of Minna and Tarama. This page was last changed on 6 January 2015, at 16:22.